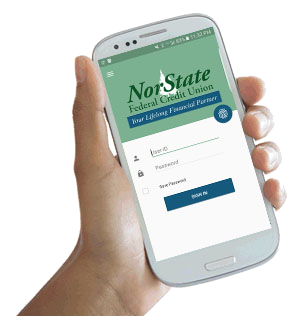 NorState Federal Credit Union makes it easy to access your account from anywhere using your Mobile Phone. We also offer many other unique services to our members. If you are not a member, sign up now to start enjoying all these great benefits. NorState Federal Credit Union would like to welcome you to our new and improved NorState FCU Mobile Banking Product! We are proud to offer this convenient service to our members, free of charge. This is one of the many benefits of becoming a member of NorState FCU. Members can now access their accounts securely from any Mobile Browser or Mobile App (Android or Apple). Click here for the full disclosure for Mobile Banking. A onetime PIN will be sent to that e-mail address with instructions on completing the process. This security feature helps protect and confirm your identity. Make sure to check your junk mail box if you don't see the message. The e-mail is sent instantly, but system response time may vary depending on your e-mail provider. E-mail addresses can be updated by calling in or logging into Online Banking on your computer and updating your login profile. Once logged in, go to Other Options - Change Login Profile, enter your current password and then update your e-mail address on the bottom and continue to complete the process. If the e-mail was sent to an account you don't have access too, call us to update your e-mail address. Once your e-mail address has been updated, we will need to reset your onetime PIN so you can start the process again to have the pin sent to the correct e-mail address. The onetime PIN will be appended to your password upon logging in, once logged in, you will never be asked again unless you change phones or delete your browser cookies. To sign up for NorState NOW, you must first register for Online Banking. After you have registered, download and install a mobile app on your device. You can download a mobile app by clicking a link below or by searching for "NorState Federal Credit Union" in the Apple or Google Play Stores. You will then be able to log in using your online banking credentials and register your device.